In terms of achieving an otherworldly glow, shortcuts are always welcome. There’s face masking, which is essentially 15 minutes to a brighter complexion. Peels are another method, though you typically have to see a derm to get that done. And, as revealed at the Well+Good TALKS event recently on inner beauty, there’s another major player on the field: IV drips… for your skin. You typically think of the intravenous modality as a staple in hospitals for getting patients hydrated (or the more recent trend of using them to replenish key nutrients post-hangover)—but now, as pointed out by Lily Kunin, wellness expert, Well+Good Council member, and founder of new health hotspot Clean Market in New York, IV drips are being administered as a quick way to get a skin boost. Curious about the next big thing in beauty? Keep reading to learn more. 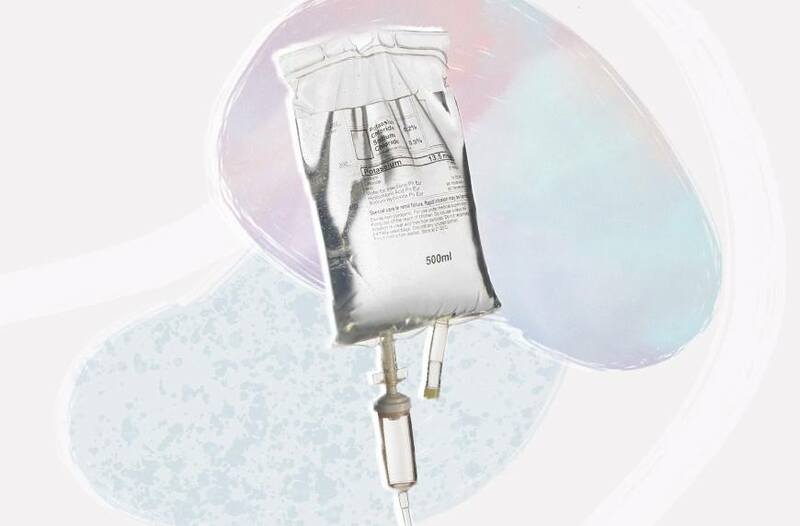 As you would imagine, injecting something intravenously is a way to fast-track the delivery of the vitamins and nutrients from the IV bag. “IV drips help replenish the body with essential vitamins and nutrients in a much more rapid manner than taking supplements,” says Joshua Zeichner, MD, a New York-based dermatologist. That’s what it means that things are more bioavailable to your body. “If you think about it, when you take in food or a supplement, you have to digest it and it has to get absorbed in order to get to the right place,” says Erika Schwartz, MD of Manhattan’s Evolved Science. “When you do an IV, you’ve bypassed all of that and you’re going directly into the bloodstream. It’s a lot faster.” All of that breaking down and digestive action is skipped, which is why IVs are used in hospitals to deliver things like antibiotics directly to the patient. These skin-boosters people are injecting include a wide range of nutrients that you’re used to seeing in topical skin care and beauty supplements. “Many of the skin-targeted drips contain minerals like magnesium and zinc, B-complex vitamins, and vitamin C, all of which support healthy skin function,” says Dr. Zeichner. Others include amino acids, saline, and electrolytes, according to Dr. Schwartz. They’re definitely making their way out of hospitals and into the world of wellness. “I don’t think it’s just a fad—it’s a medical, conventional way of reaching your internal organs to produce external results,” she adds. “We’re refining it and it’s becoming a regular tool box of prevention, health, and beauty.” So don’t be surprised if on your next beauty treatment menu you see the option of getting injected with skin-enhancing goodness. Just make sure it’s by a nurse or a similarly officially trained medical pro. If you’re looking for other ways to achieve inside-out beauty, these are the best supplements for clear, glowy skin. You could also sip on these smoothies for a healthy glow.